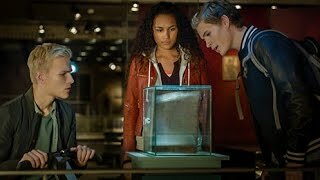 The curious Nora, Simen and Lars decide to start the hunt for the sacred Olav shrine in or around the medieval church Nidaros Dome, which has been gone for hundred of years. But they are not the only ones interested in finding the treasure. You can buy "TRIO - The Hunt for the Holy Shrine" on Plejmo, Apple iTunes, Google Play Movies as download or rent it on Apple iTunes, Google Play Movies, Plejmo, Viaplay online.